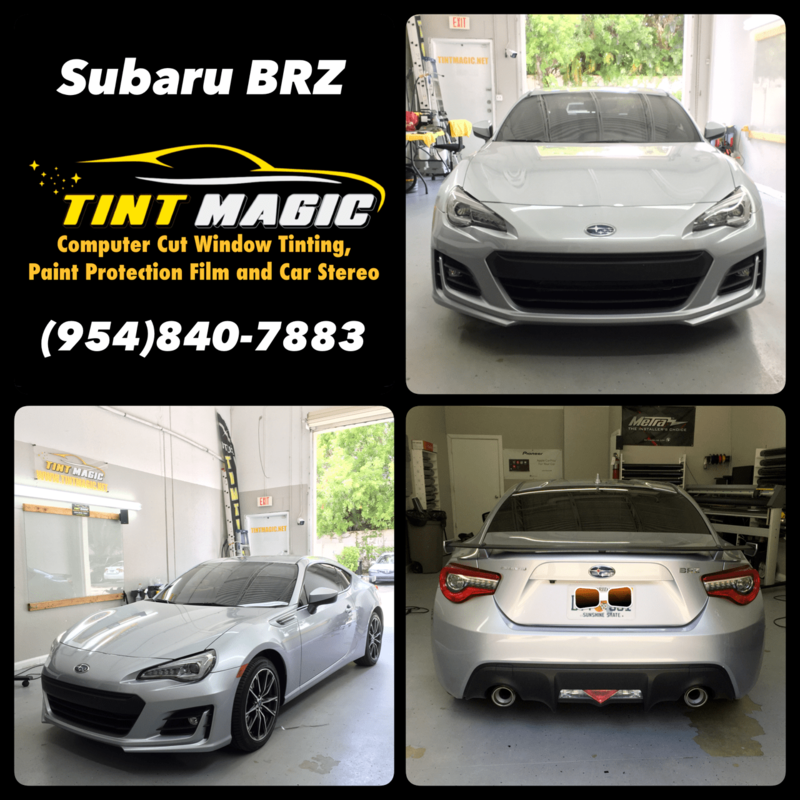 Subaru BRZ Window Tint at Tint Magic Coral Springs, Parkland, Coconut Creek, Tamarac, Boca Raton, Deerfield Beach, Sunrise, Weston. Call us for the best quality and service! (954)840-7883. We use Llumar and Suntek window film made in USA. Don’t let the boy-racer vibe deter you: The BRZ is perfect for purists on a budget. An updated 205-hp version of the 2.0-liter flat-four pairs to a six-speed manual, hardly answering complaints that the rear-drive sports car lacks punch. Output drops to 200 hp with the six-speed automatic. Still, the BRZ is impeccably balanced and satisfying, not to mention slide-happy. There’s not much trunk space and adults will reject the back seat, but once behind the wheel, those objections melt away. Several carefully chosen engine tweaks net Subaru’s nippy little sports car just 5 horsepower and 5 lb-ft of torque more than before. There also were some structural enhancements here and there that made the sort of difference that Subaru can’t be bothered to calculate in percentages of improved chassis stiffness. Yet the road feel is remarkably improved, particularly from behind the wheel of a BRZ equipped with the optional Performance package. An $1195 option available only for the $28,465 Limited trim with the six-speed manual transmission, the Performance package effectively results in a car costing $3345 more than the base BRZ Premium. And forget about it if you eschew clutch pedals. The hardware includes larger 12.8-inch front and 12.4-inch rear brake rotors (up from 11.6 and 11.4) clamped by Brembo four-piston front and dual-piston rear calipers, along with Sachs dampers and 17-inch wheels that are 7.5 inches wide rather than the standard 7.0 inches.